19" Medical Panel PC,with Pentium G620T 2.2GHz,2GB DDR3 RAM,320GB HDD,Wireless 802.11a/b/g/n,Touch screen,Slim DVD-RW,AC to DC 19V power adapter,DICOM GSDF Calibrated. 19" Medical Panel PC,H61 platform, Core i3 2100T 2.5Ghz,TDP 35W, 2GB DDR3 RAM,320GB HDD,Wireless 802.11a/b/g/n,Touch screen,Slim DVD-RW,AC to DC 19V power adapter,DICOM GSDF Calibrated,R10. 19" Medical Panel PC,H61 platform, Core i5 2390T 2.7Ghz,TDP 35W, 2GB DDR3 RAM,320GB HDD,Wireless 802.11a/b/g/n,Touch screen,Slim DVD-RW,AC to DC 19V power adapter,DICOM GSDF Calibrated,R10. 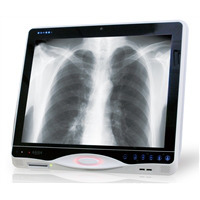 19" Medical Panel PC,with Pentium G620T 2.2GHz,2GB DDR3 RAM,320GB HDD,Wireless 802.11a/b/g/n,Touch screen,Slim DVD-RW,AC to DC 19V power adapter. 19" Medical Panel PC,H61 platform, Core i3 2100T 2.5Ghz,TDP 35W, 2GB DDR3 RAM,320GB HDD,Wireless 802.11a/b/g/n,Touch screen,Slim DVD-RW,AC to DC 19V power adapter,R10. 19" Medical Panel PC,H61 platform, Core i5 2390T 2.7Ghz,TDP 35W, 2GB DDR3 RAM,320GB HDD,Wireless 802.11a/b/g/n,Touch screen,Slim DVD-RW,AC to DC 19V power adapter,R10. 19" Medical Panel PC,with Pentium G620T 2.2GHz,2GB DDR3 RAM,320GB HDD,Wireless 802.11a/b/g/n,Touch screen,Slim DVD-RW,LED Dash Light,RFID,Smart Card Reader,AC to DC 19V power adapter. 19" Medical Panel PC,H61 platform, Core i3 2100T 2.5Ghz,TDP 35W,2GB DDR3 RAM,320GB HDD,Wireless 802.11a/b/g/n,Touch screen,Slim DVD-RW,LED Dash Light,RFID,Smart Card Reader, AC to DC 19V power adapter,R10. 19" Medical Panel PC,H61 platform, Core i5 2390T 2.7Ghz,TDP 35W,2GB DDR3 RAM,320GB HDD,Wireless 802.11a/b/g/n,Touch screen,Slim DVD-RW,LED Dash Light,RFID,Smart Card Reader, AC to DC 19V power adapter,R10.